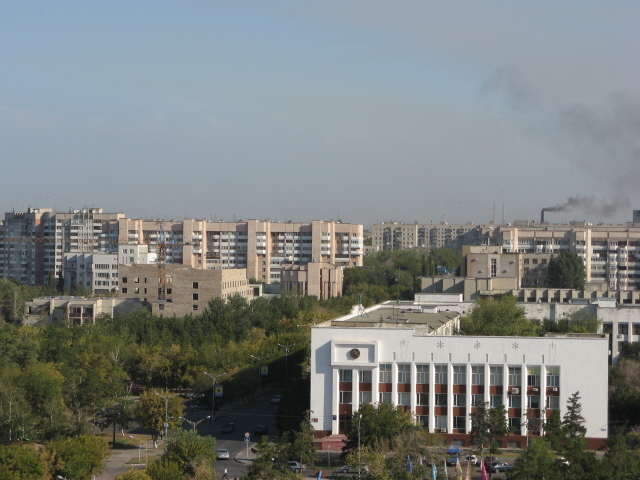 The capital of the province of the same name in the north-east of Kazakhstan. By no means a premier dark tourism destination, but a rather convenient stopover when travelling in the region. And a couple of minor points of interest of the Soviet legacy type can keep the dark tourist entertained too. What there is to see: not an awful lot, but if you happen to make a stopover here, then you should pay a visit to the city's two Lenins and other bits of Soviet-era statuary. 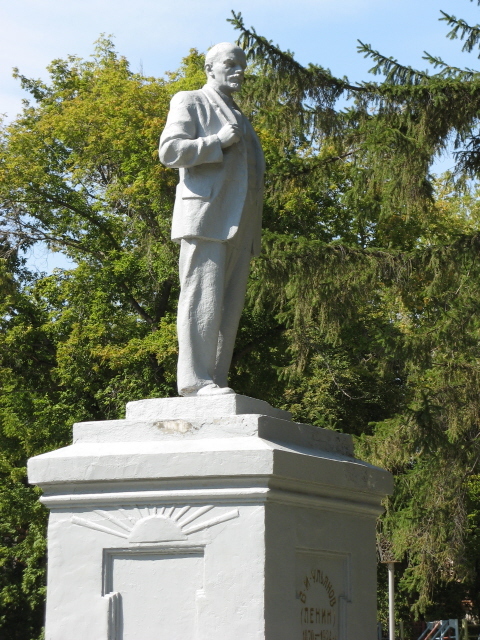 One set is found in a park towards the northern end of Lenin Street. Apart from an eponymous Lenin, wearing a cap and coat with one hand placed confidently on his lapel, it also contains a concrete relief slab with the usual troika of Marx, Engels & Lenin as well as a standard T-34 tank on a plinth by the park entrance. The other Lenin is to be found in yet another little park to the south of the city centre, also off Lenin Street, on the corner of Tolstoy Street. This is a rather modest-sized but silver-coloured Lenin standing on a somewhat oversized plinth that makes its occupant look even more diminutive. More remarkable from a dark tourism perspective is another monument in this park, closer to the street – it involves the fractured symbolic shape of an atom and a silhouette of a man throwing his arms up in the air, presumably in despair: this is a memorial monument to the victims of the Chernobyl disaster. There's also a war memorial in the centre of the city in the park between Kairbaev and Krivenko Streets. Otherwise there's not much to see on the dark front – unless you count the ominous smoke plumes rising from the huge heavy industry plants that surround the city and pollute the region in the old Soviet, unhampered, smoking-chimney-stacks-are-good-signs-of-progress tradition. Those with a taste for the associated old-fashioned industrial wasteland "scenery" could try driving closer past the actual locales of all that pollution, including huge chemical and metallurgical plants, an oil refinery, an aluminium factory and a few power stations. Location: on the banks of the river Irtysh in the far north-east of Kazakhstan, just a bit over 50 miles (80 km) from the border with Russia (southern Siberia), 200 miles (320 km) north-west of Semey and a good 250 miles (400 km) east of the capital Astana. Access and costs: quite remote, but fairly well connected, affordable. Details: if you're not coming here as part of an organized tour but independently, then that's most easily and conveniently done by either train or plane (frequent connections to/from both Almaty and Astana, plus a few extra trains to Karaganda or even onwards into Russia). Getting around the city centre is easy enough on foot. 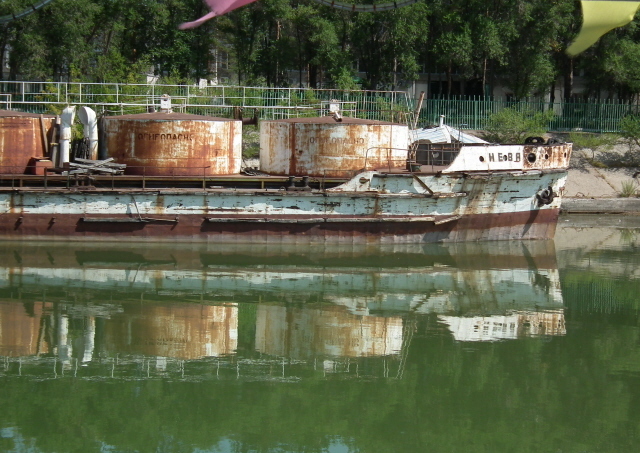 Boats offer cruises on the river (see below). 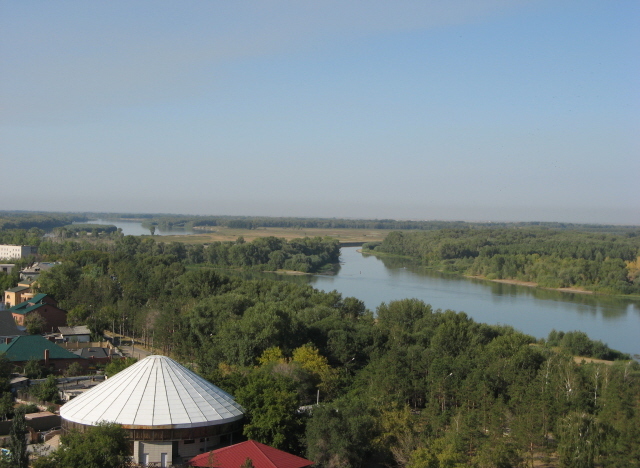 There are a few hotels in the city that are decent enough, including the one taking its name from that of the city (for simplicity's sake and in fine Soviet tradition), which offers great views over the city and/or the river. Likewise there's an OK range of eating-out options, though you shouldn't expect anything spectacular, but neither would you have to expect great expenses. Time required: if you can spare a few hours for a good look around and maybe a boat trip, that's well enough. 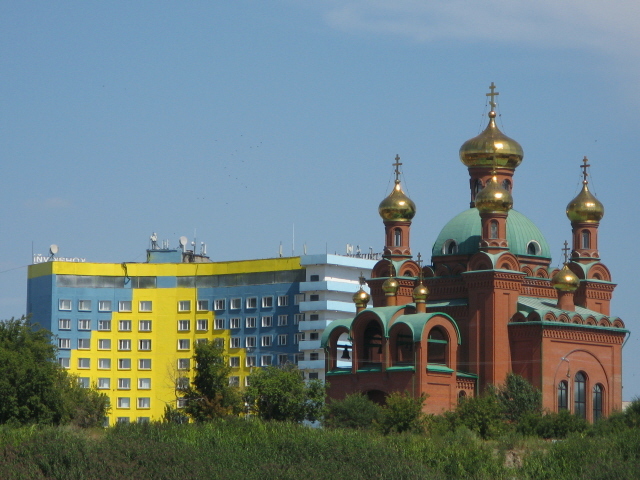 Combinations with other dark destinations: Pavlodar's location makes it a convenient stopover on journeys between Astana or Ekibastuz (or even Karaganda) and Semey further south-east, which could also be reached via Kurchatov and parts of the Polygon. Within easy reach for a return day trip is Aksu with its communist statue park. 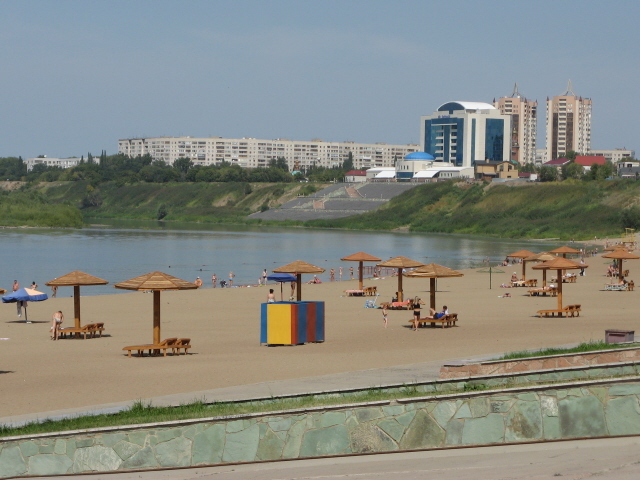 Combinations with non-dark destinations: for such a provincial city in the far north-east of Kazakhstan, Pavlodar is quite a pleasant place. 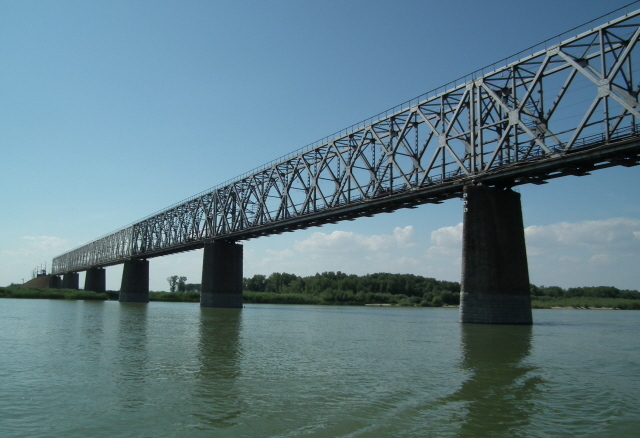 It benefits greatly from its riverside location on the mighty Irtysh. 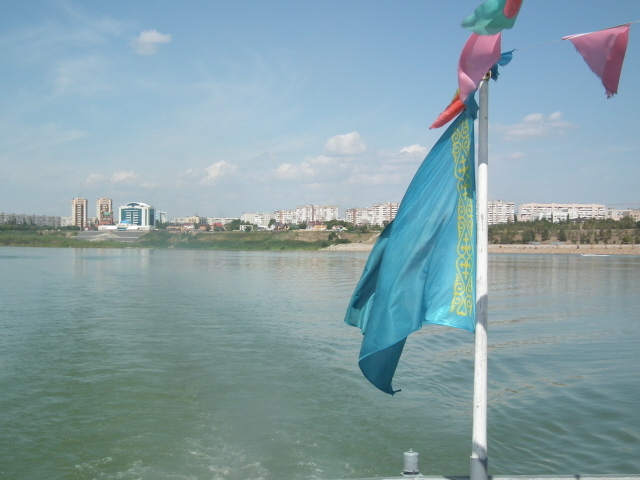 The city sits on the right/eastern bank of the river overlooking broad expanses of floodplains, reed belts and woods amongst the various secondary channels of the Irtysh. The navigable main river channel offers scenic boat rides that depart from the river station just south of the main promenade and pleasure beach (ca. every two hours for ca. one-hour cruises, ca. 400 KZT). In the city itself, one major attraction is the distinctive modern Mashhur Zhusup Mosque with its spiky minarets and greenish central dome. The latter's unusual shape has been likened to Darth Vader's helmet, and indeed once you look it at that way it's hard to remain as totally serious as a visit to such a religious centre would normally require. The inside is also worth a look, though it's rather less spectacular than the outside or the interiors of classic grand mosques such as those in Istanbul, Turkey. The huge chandelier is quite impressive though. 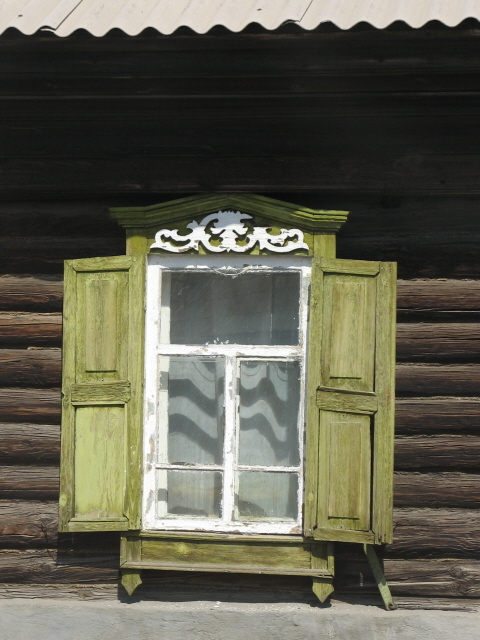 In Pavlodar there are still quite a few surviving wooden houses from the Tsarist era, making for a very pretty, and very, very Russian look. These are mostly located to the south of the city centre. One of them houses the regional history museum (Tuesday to Sunday 10 a.m. to 6 p.m., 300 KZT), which I found extremely boring, though. There are also a couple of house museums dedicated to local greats who are most likely to be totally unknown to outsiders. More rewarding are strolls around the parks and along the river embankment (leading to the new landmark Blagoveshchensk Cathedral, which inside isn't even finished yet). 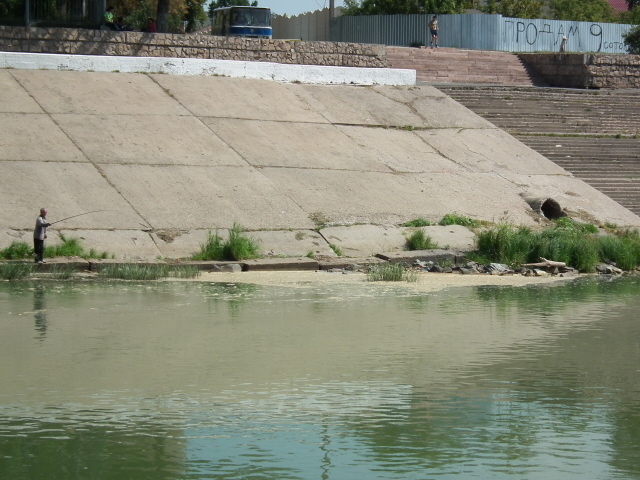 Locals even go swimming in the river and you can see anglers trying their luck – even right next to the quite visible pollution from (presumably) raw sewage. Further afield, there are a few lakes (esp. Koryakovka and Maraldy) that are local attractions not only for being scenic but more so for the alleged medicinal properties of their waters and mud.